Robert Frost was a traditional American poet in an age of experimental art. He used New England expressions, characters, and settings, recalling the roots of American culture, to get at the common experience of all. 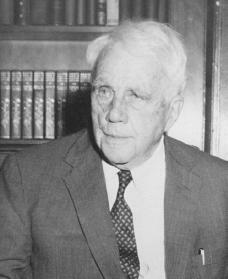 Robert Lee Frost was born in San Francisco, California, on March 26, 1874. His father, William, came from Maine and New Hampshire ancestry and had graduated from Harvard in 1872. He left New England and went to Lewistown, Pennsylvania, to teach. He married another teacher, Isabelle Moodie, a Scotswoman, and they moved to San Francisco, where the elder Frost became an editor and politician. Robert, their first child, was named for the Southern hero General Robert E. Lee (1807–1870). When Frost's father died in 1884, his will requested that he be buried in New England. His wife and two children, Robert and Jeanie, went east for the funeral. Lacking funds to return to California, they settled in Salem, Massachusetts, where his grandfather had offered them a home. Eventually Mrs. Frost found a job teaching at a school. As a young boy, Robert loved his mother reading to him. Her influence introduced him to a large variety of literature, and from this he was inspired to become an excellent reader. He lacked enthusiasm for school in his elementary years, but became a serious student and graduated from Lawrence High School as valedictorian (top in his class) and class poet in 1892. He enrolled at Dartmouth College but soon left. He had become engaged to Elinor White, classmate and fellow valedictorian, who was completing her college education. Frost moved from job to job, working in mills, at newspaper reporting, and at teaching, all the while writing poetry. In 1894 he sold his first poem, "My Butterfly," to the New York Independent. Overjoyed, he had two copies of a booklet of lyrics privately printed, one for his fiancée and one for himself. He delivered Elinor's copy in person but did not find her response to be enthusiastic. Thinking he had lost her, he tore up his copy and wandered south as far as the Dismal Swamp (from Virginia to North Carolina), even contemplating killing himself. In 1895, however, Frost married Elinor and tried to make a career of teaching. He helped his mother run a small private school in Lawrence, Massachusetts, where his first son was born. He spent two years at Harvard, but undergraduate study proved difficult while raising a family. With a newborn daughter as well as a son to now raise, he decided to try chicken farming at Methuen, Massachusetts, on a farm purchased by his grandfather. In 1900, when his nervousness was diagnosed as a sign that he may possibly contract tuberculosis (a disease caused by bacteria that usually attacks the lungs but can also affect other organs in the body), he moved his poultry business to Derry, New Hampshire. There his first son soon died. In 1906 Frost was stricken with pneumonia (a disease that causes inflammation of the lungs) and almost died. A year later his fourth daughter died. This grief and suffering, as well as lesser frustrations in his personal and business life, turned Frost more and more to poetry. Once again he tried teaching, in Derry and then in Plymouth, New Hampshire. In 1912, almost forty and with only a few poems published, Frost sold his farm and used an allowance from his grandfather to go to England and gamble everything on poetry. The family settled on a farm in Buckinghamshire, and Frost began to write. Ezra Pound (1885–1972), another American poet, helped him get published in magazines, and he met many people in literature that helped to inspire and further expand his knowledge of poetry. Frost published A Boy's Will (1913), and it was well received. Though it contains some nineteenth-century expressions, the words and rhythms are generally informal and subtly simple. North of Boston (1914) is more objective, made up mainly of blank verse (poetry without rhyme) monologues (long speeches, plays, or entertainment given by a single person) and dramatic narratives (stories or descriptions of events). North of Boston added to the success of A Boy's Will, and the two volumes announced the two modes of Frost's best poetry, the lyric (a poem telling of love or other emotions) and the narrative. Although immediately established as a nature poet, he did not glorify nature. He addressed not only its loveliness but also the isolation, harshness, and pain its New England inhabitants had to endure. When the Frosts returned to the United States in 1915, North of Boston was a bestseller. Sudden fame embarrassed Frost, who had always avoided crowds. He withdrew to a small farm in Franconia, New Hampshire, but financial need soon saw him responding to demands for readings and lectures. In 1915 and 1916 he was a Phi Beta Kappa (an organization made up of college students and graduates who have achieved a high level of academic excellence in studies of liberal arts and sciences) poet at Tufts College and at Harvard University. He conquered his shyness, developing a brief and simple speaking manner that made him one of the most popular performers in America and abroad. In 1916 Frost published Mountain Interval, which brought together lyrics and narratives in his poetry. In 1917 Frost became one of the first poets-in-residence on an American campus. He taught at Amherst from 1917 to 1920, in 1918 receiving a master of arts, the first of many academic honors. The following year he moved his farm base to South Saftsbury, Vermont. In 1920 he cofounded the Bread Loaf School of English of Middlebury College, serving there each summer as lecturer and consultant. From 1921 to 1923 he was poet-in-residence at the University of Michigan. Frost's Selected Poems and a new volume, New Hampshire, appeared in 1923. Frost received the first of four Pulitzer Prizes for the latter in 1924. Though the title poem does not present Frost at his best, the volume also contains such lyrics as "Fire and Ice," "Nothing Gold Can Stay," and "To Earthward." Frost returned to Amherst for two years in 1923 and to the University of Michigan in 1925 and then settled at Amherst in 1926. In 1928 Frost published West Running Brook, in which he continued his use of tonal variations (changes in sound and rhythm) and a mixture of lyrics and narratives. Frost visited England and Paris in 1928 and published his Collected Poems in 1930. In 1934 he suffered another painful loss with the death of his daughter Marjorie. He returned to Harvard in 1936 and in the same year published A Further Range. Because of Frost's weak lungs, his doctor ordered him south in 1936, and thereafter he spent his winters in Florida. Frost served on the Harvard staff from 1936 to 1937 and received an honorary doctorate. After his wife died of a heart attack in 1938, Frost resigned from the Amherst staff and sold his house. That same year he was elected to the Board of Overseers of Harvard College. In 1939 his second Collected Poems appeared, and he began a three-year stay at Harvard. In 1940 his only surviving son took his own life. In 1945 Frost composed something new in A Masque of Reason, an updated version of the biblical story of Job. A Masque of Mercy (1947), was a companion verse drama (a dramatic poem) based on the biblical story of the prophet Jonah. Frost's Complete Poems appeared in 1949, and in 1950 the U.S. Senate honored him on his seventy-fifth birthday. In 1957 he returned to England to receive doctoral degrees from Oxford and Cambridge. On his eighty-fifth birthday the Senate again honored him. In 1961, at the inauguration of John F. Kennedy (1917–1963), Frost recited "The Gift Outright," the first time a poet had honored a presidential inauguration. A final volume, In the Clearing, appeared in 1962. On January 29, 1963, Frost died in Boston, Massachusetts, of complications following an operation. He was buried in the family plot in Old Bennington, Vermont. Brodsky, Joseph, Seamus Heaney, and Derek Walcott. Homage to Robert Frost. New York: Farrar, Straus, and Giroux, 1996. Meyers, Jeffrey. Robert Frost: A Biography. Boston: Houghton Mifflin, 1996. Parini, Jay. Robert Frost: A Life. New York: Henry Holt, 1999. Robert Frost was born March 26 1874 and died January 29 1963.He was a really famous poet.He had one sister and six children.